On July 7th, 2015, our client Jason Minton was accused of sexual battery on a person eighteen years or older and kidnapping with intent to commit or facilitate the commission of a felony. The incident occurred after Minton and the alleged victim went to a local bar, where the alleged victim willingly consumed multiple alcoholic beverages. In her police statement, she accused Minton of force-feeding her a white pill that impaired her memory, forcing her into his vehicle, engaging in nonconsensual sexual relations with her, and confining her to his home. However, testing performed at a local hospital showed no trace of the pill - or any drug except marijuana, which she admitted to smoking - in the alleged victim's system, nor did it show a single mark of injury or sexual penetration. The charges were extremely serious - punishable by life in prison - but the details of the alleged victim's story never made sense. To quote Attorney Aaron Delgado, "It's in the details that you'll find this case doesn't add up." (See the Defense Opening Statement.) We decided to put the facts before a jury of Mr. Minton's peers and let them determine that Mr. Minton was not guilty of the charges leveled against him. On November 30, 2016, the State attempted to introduce evidence of another crime committed by Mr. Minton. Before this type of testimony is admissible, the State was required to conduct what is known as a Williams Rule hearing, named after the seminal case addressing the admissibility of this type of evidence. Evidence like this would have been extraordinarily damning because it would have allowed the jury to hear about a past criminal incident, thereby coloring the jury's view of the defendant. Lead Attorneys David Damore and Aaron Delgado thoroughly prepared to defend against the inclusion of the Williams Rule witness. As part of their research, they actually tracked down Mr. Minton's defense attorney from the 1998 case where the witness originally testified. 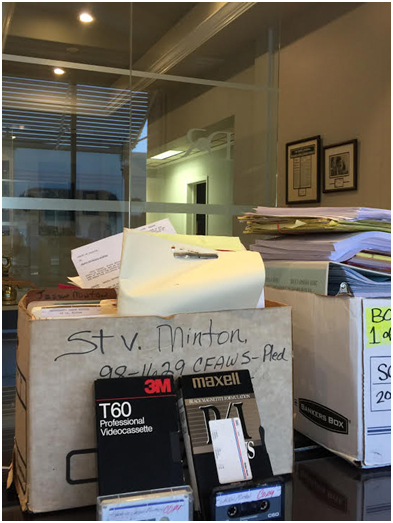 That defense attorney provided VHS and cassette tapes (pictured below) of the Williams Rule witness' testimony, which proved to be the only preserved record of what she said happened at the time. Due to the exposure of these tapes, Mr. Delgado was able to highlight at the Williams Rule hearing all of the inconsistencies between the Williams Rule witness' present-day testimony and her testimony almost twenty years ago, thereby undermining her credibility. This allowed us to defeat the State's Williams Rule motion and prevented prejudicial evidence from being admitted against our client. Prior to the start of the trial, we raised a very important issue in our Motion in Limine. Though it was not granted in its entirety, our submission of case law and argument on the topic ensured that the issue was preserved for later appeal should the trial have resulted in an unfavorable verdict. During the State's presentation of evidence, Attorneys David Damore and Aaron Delgado effectively cross examined each State witness, highlighting flaws in their testimonies and shining a spotlight on law enforcement's investigatory deficiencies. The flaws in the State's case became evident to everyone in the courtroom. After the State rested its case, we were prepared with a comprehensive Motion for Judgment of Acquittal. Once Aaron Delgado argued the Motion, the Judge dismissed the kidnapping charge completely. This was a huge victory for the defendant and dealt a big blow to the State's case. Soon after the Judge granted the Motion for Judgment of Acquittal, and before the defense presented any of its evidence or witnesses, the prosecutor offered Mr. Minton a deal that was just too good to pass up given what was at stake: a plea to a misdemeanor offense with a non-incarceration sentence of one year's probation. Mr. Minton went from facing the possibility of life in prison to walking out of the courtroom a free man in less than two full days of trial. Here at Delgado & Romanik, we will pursue every possible angle for our clients - even if that means digging through twenty-year-old evidence and finding working cassette and VHS players. If you have something to lose, hire the best attorneys you can find. Hire Your Community Law Firm.